You won't get it unless you've played Mario Sunshine. Oh yeah, I forgot to add the great doctor to the list. Why can't I see the winning pic? It won't let me! The person's bandwidth has been exceeded. I'll describe it to you though, since I saw it when it was first posted. 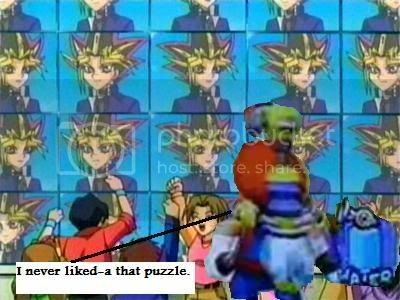 It was a photoshopped picture of Guess Who, Yu-Gi-Oh! Edition. Yugi: "My Card Playing comrades... Stupid arguements start a card game... But Obscene holographic monsters and pieces of card finish them"